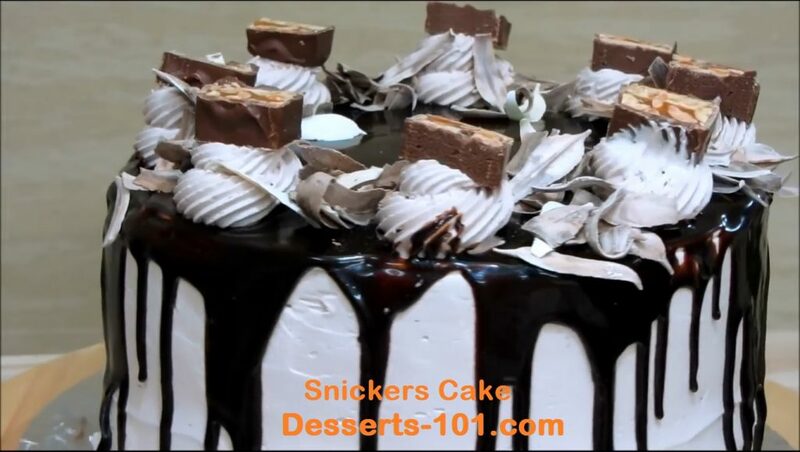 If you love a Snicker’s Bar® you will love this cake. Chocolate sponge cake moistened with rum flavored simple syrup, filled with Swiss Meringue Buttercream and Snicker’s Bar pieces topped with more Swiss Meringue Buttercream, Chocolate ganache, chocolate curls and more Snicker’s Bar pieces. This has to be the best cake out there. My ingredients set out to assemble the snickers cake. 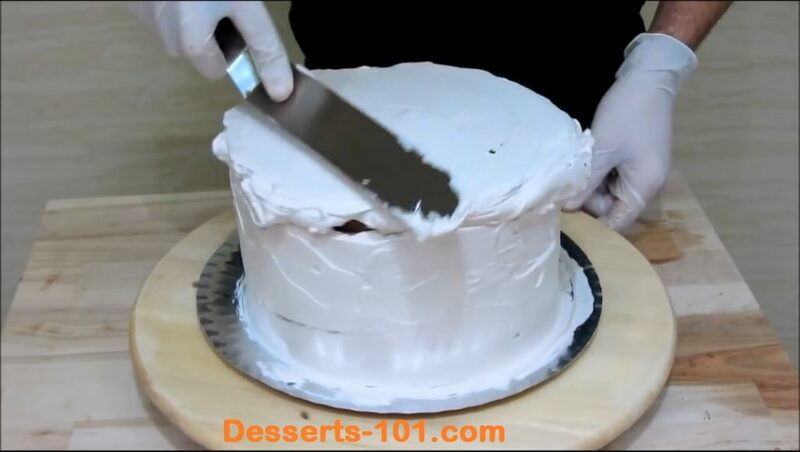 How to slice a cake layer into multiple pieces. I used Chocolate Sponge Cake (use my new improved vanilla sponge cake where I replaced 1/2 cup (65g) of flour with 2/3 cup (60g) of unsweetened cocoa powder to make it chocolate) I then baked 2 layers of cake in 8-inch x 3 inch (20 cm x 7.5 cm) pans and cut each layer into 3 pieces of equal size. 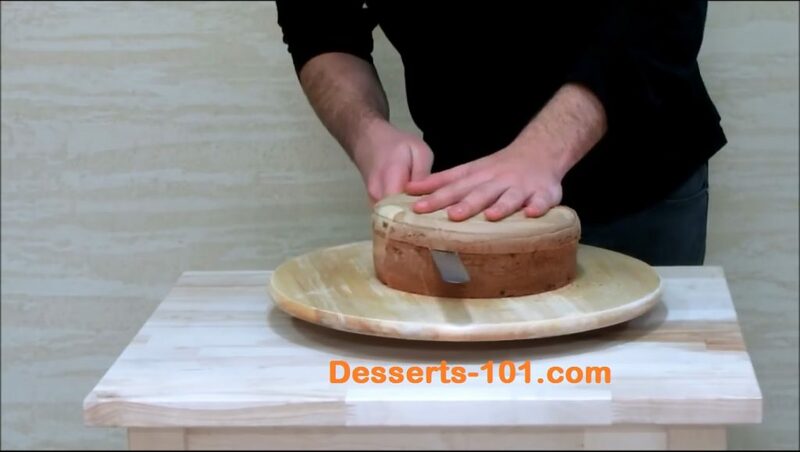 The unused layer can be used for something else or becomes a cooks treat. 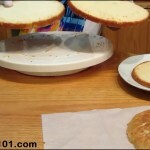 (You can always bake 3 cake layer at 8-inch x 2-inch (20 cm x 5 cm) and cut these layers in half. 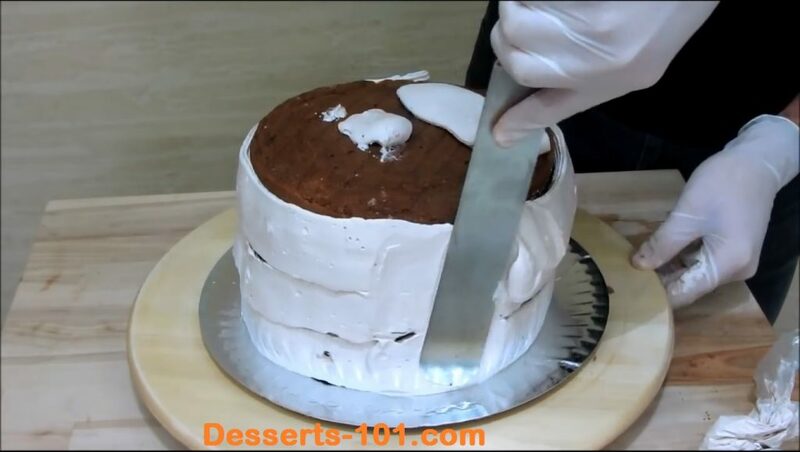 Rotate the cake and keep working the knife towards the center of the cake. 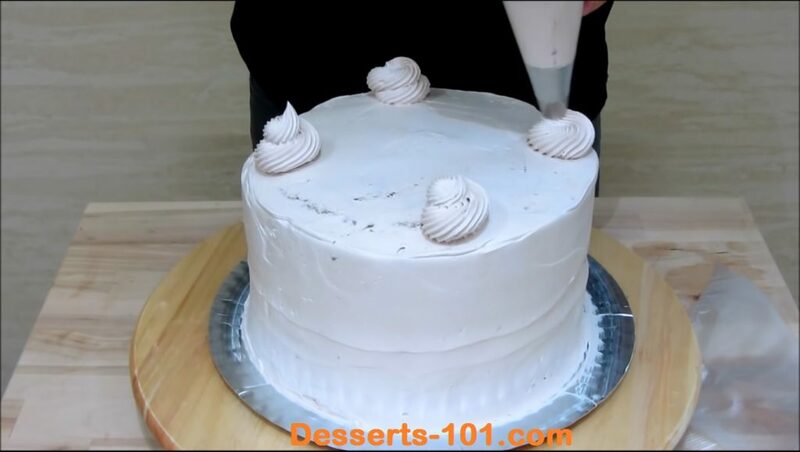 Apply a dab of icing to the cake board to hold the cake secure to the board. 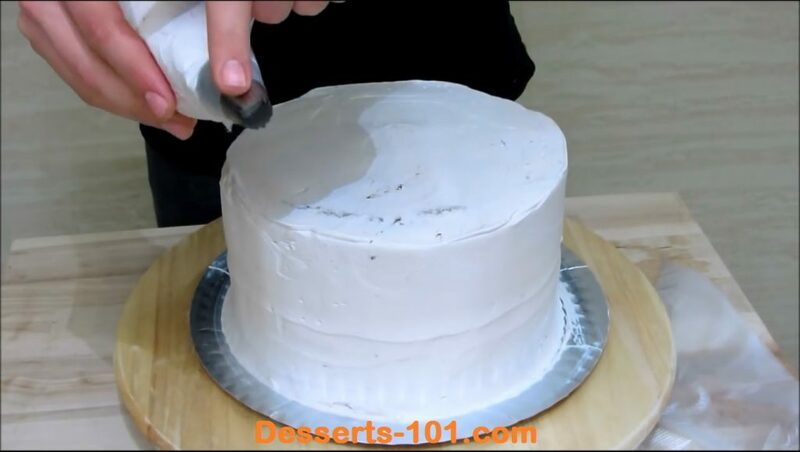 Place the bottom layer firmly on the cake board. 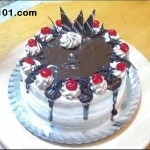 Moisten the cake with rum flavored simple syrup. To make the rum flavored simple syrup – follow my recipe for simple syrup and flavor with rum extract (my rum extract has a red color so it colored the syrup.) 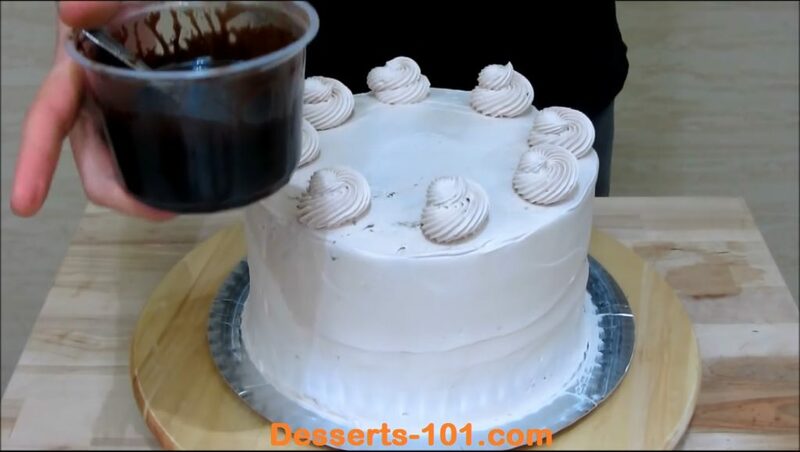 To moisten the cake you can use a pastry brush and brush it on or use a bottle and sprinkle it on or do like I show here where I use a measuring cup. Be careful not to over moisten.) Next spread a layer of Swiss Meringue Buttercream on. I find it easiest to pipe it our of a piping bag. I am using a large round tip, but you can use a plain coupler or no tip/couple at all. 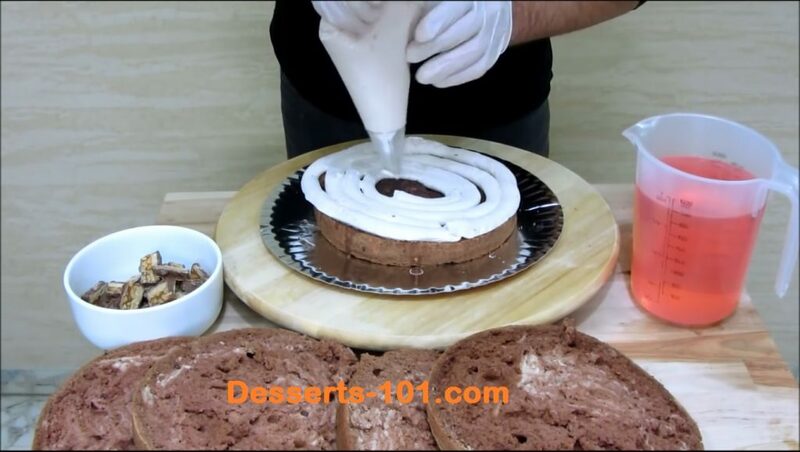 You can even spread it on with an icing spatula but you will get crumbs mixed in easier. 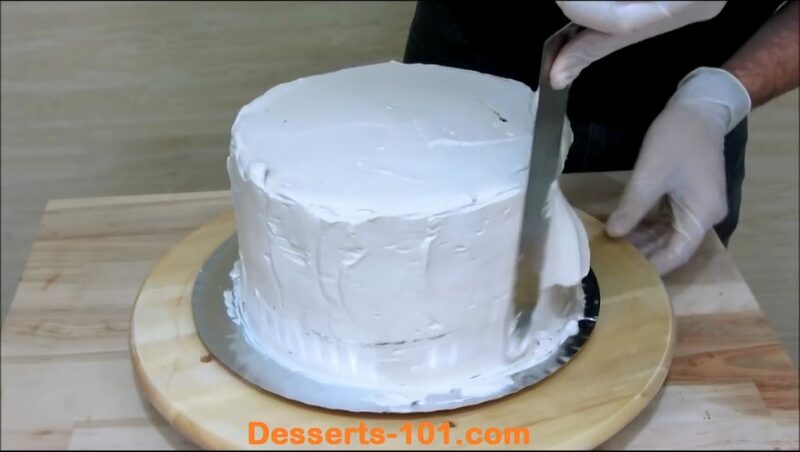 Add some simple syrup to keep the cake moist. 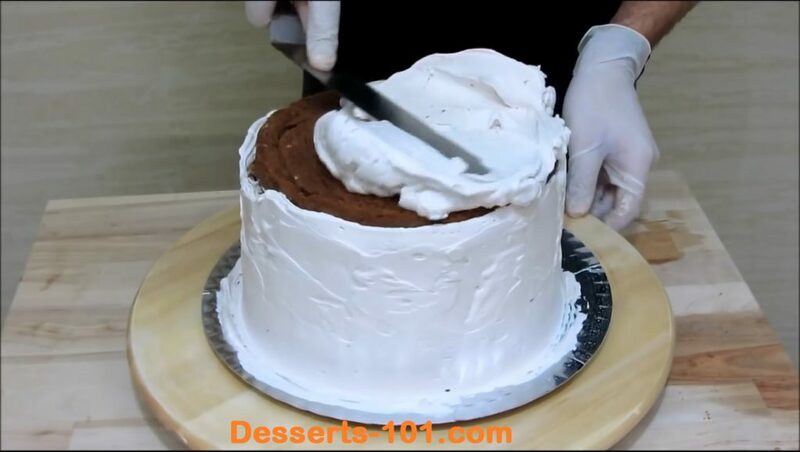 Adding a layer of buttercream icing. 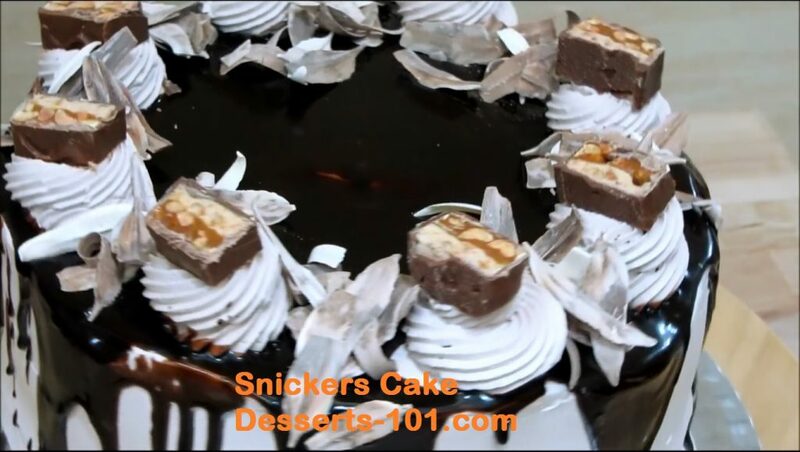 Add some cut pieces of snicker’s bar® on the icing and then top with another layer of cake and moisten with simple syrup. I like saving a layer of cake with a square edge and have that edge on the very top. This way the top is level and the top edge is square. (This is the bottom of the cake in the baking pan.) 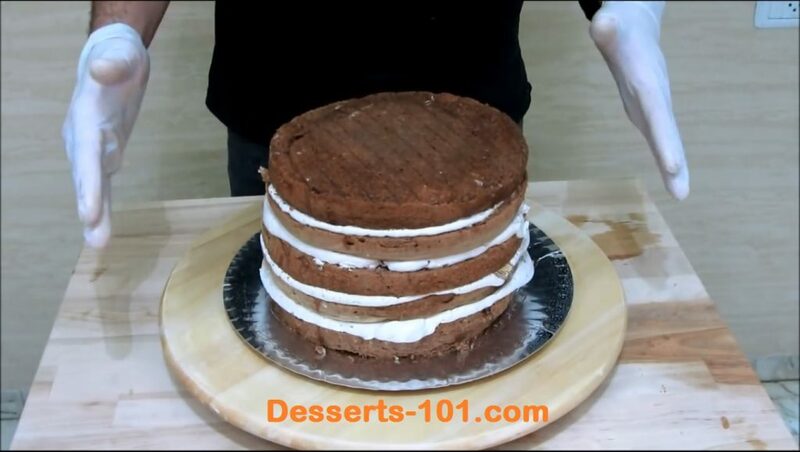 Continue stacking the cake with buttercream and Snicker’sBar® pieces, cake layer and simple syrup until fully stacked. Ice the cake smooth. 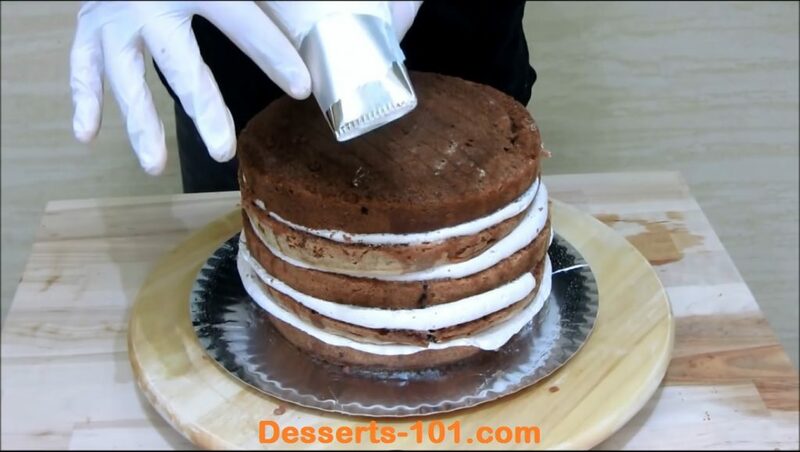 I like to use a cake icer tube which helps keep crumbs out of my icing. Ice the top smooth, let the extra over the side. 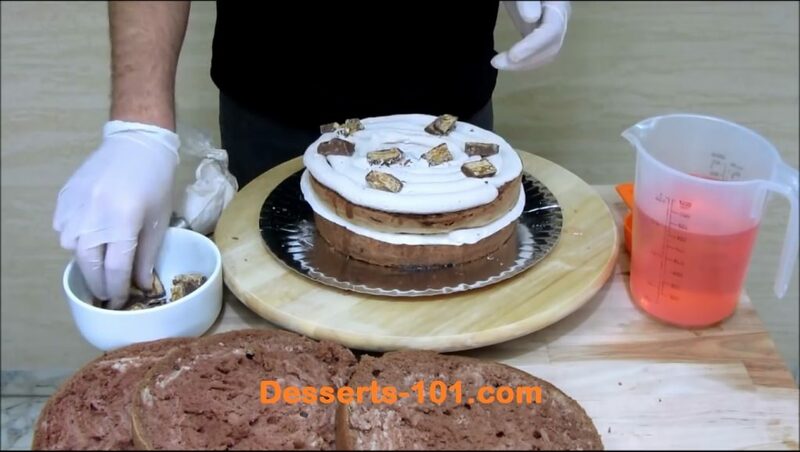 Using a pastry bag fitted with an Ateco #866 (French Star) tip, pipe four rosettes on the cake then pipe a rosette in between the four rosettes. 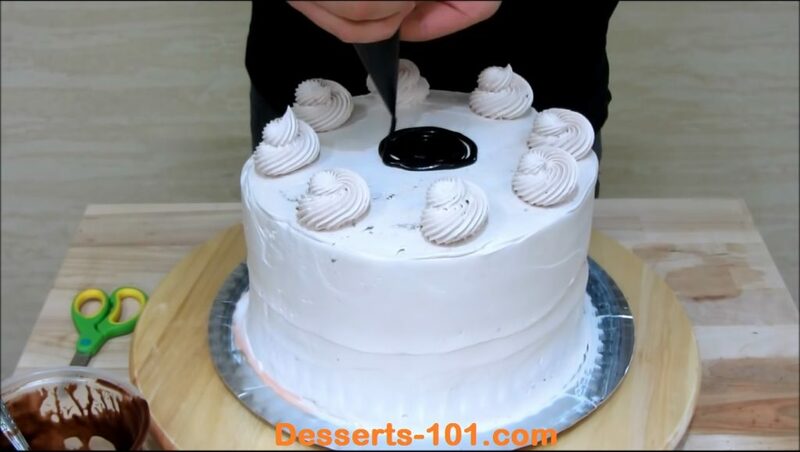 Pipe for rosettes equally spaced on the cake. Piping 4 more rosettes in between each of the rosettes for a total of 8. Heat the chocolate ganache until it is warm enough to pour. Do not over heat. 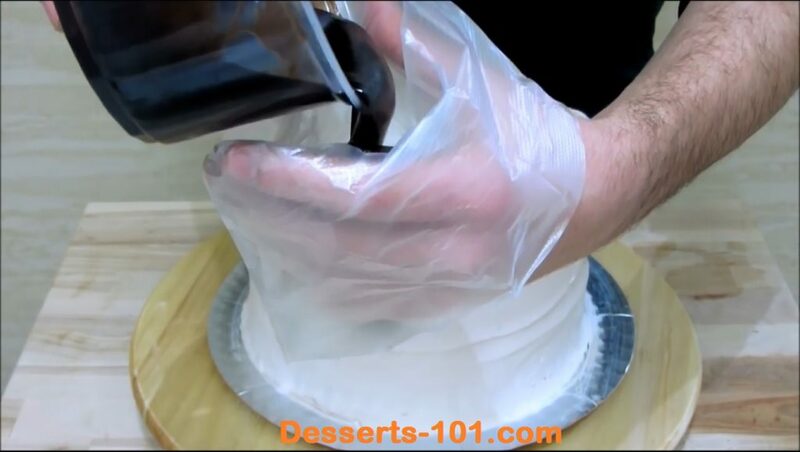 Pour the ganache into a pastry bag, cut the end off the bag to so you can control how it flows out and starting from the center of the cake add you ganache. Goes between and around the rosettes. 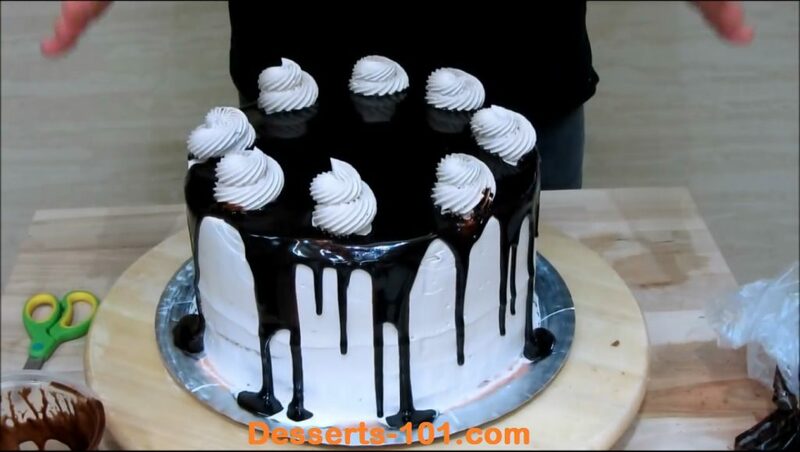 You want some ganache to drip down the side of the cake. Ganache that has been warmed to a pouring temperature. Decorate with Snicker’s Bar® Pieces and Chocolate Curls. Add a cut Snicker’s bar® piece to each rosette and optionally sprinkle some chocolate curls between the rosettes to complete the cake. The video is in Arabic, but you can watch and follow my directions here and know what is happening. 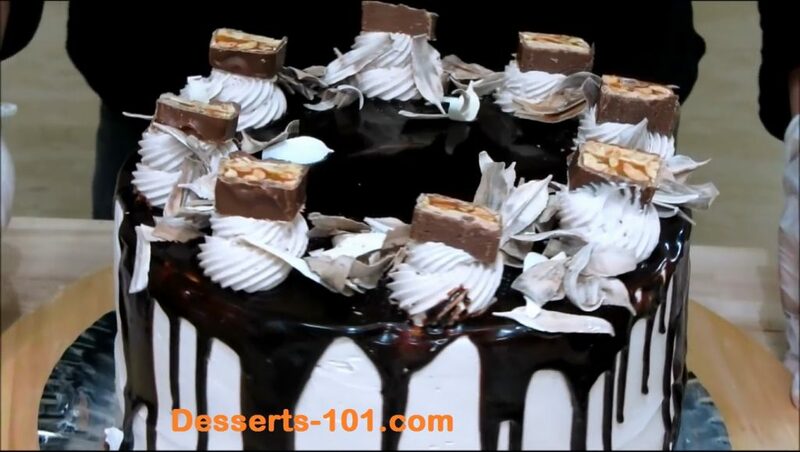 Decorating a Snicker's Bar® Cake and enjoy one of the most favorite candy bars in a cake. I used Chocolate Sponge Cake (use my new improved vanilla sponge cake where I replaced ½ cup (65g) of flour with ⅔ cup (60g) of unsweetened cocoa powder to make it chocolate) I then baked 2 layers of cake in 8-inch x 3 inch (20 cm x 7.5 cm) pans and cut each layer into 3 pieces of equal size. 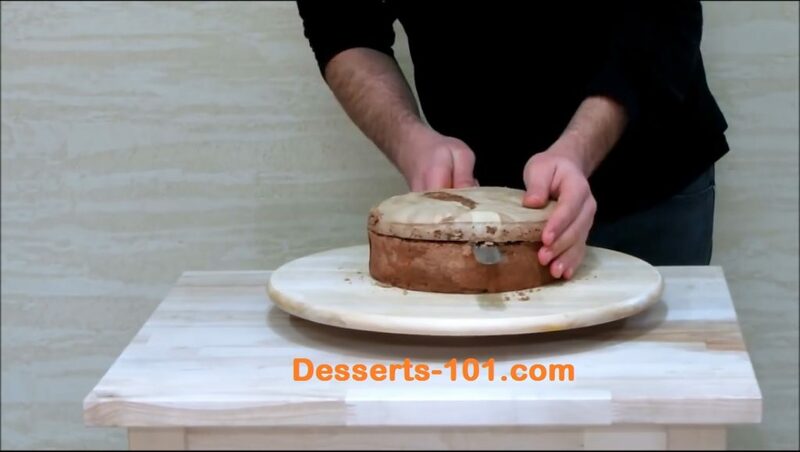 The unused layer can be used for something else or becomes a cooks treat. 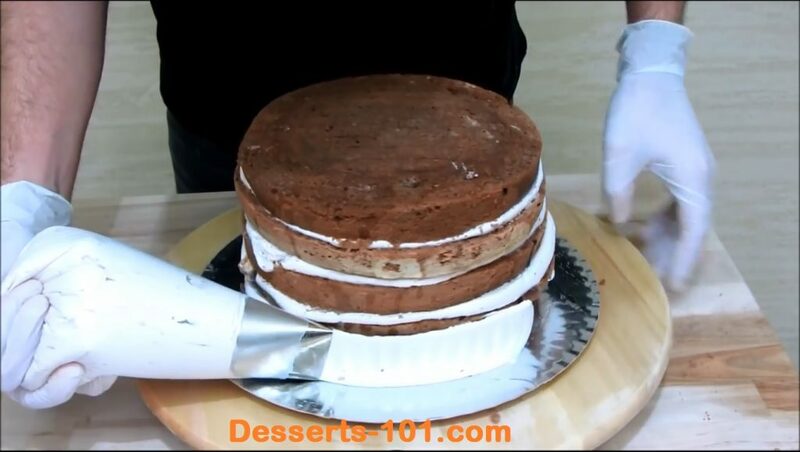 (You can always bake 3 cake layer at 8-inch x 2-inch (20 cm x 5 cm) and cut these layers in half. 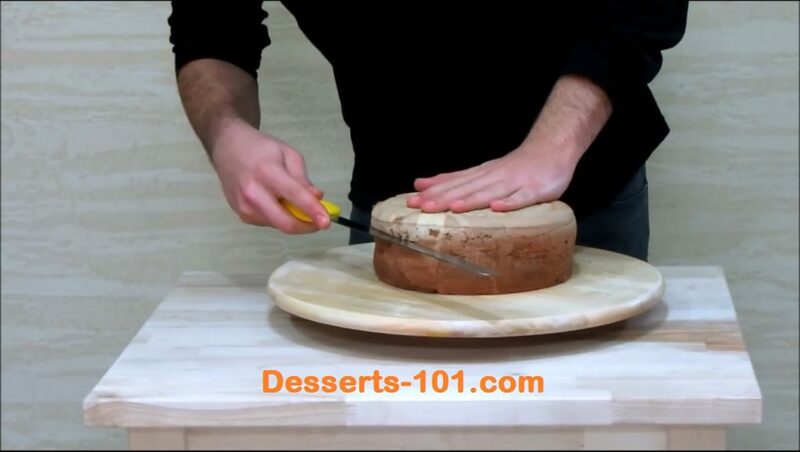 Apply a dab of icing to the cake board to hold the cake secure to the board. Next spread a layer of Swiss Meringue Buttercream on. I find it easiest to pipe it our of a piping bag. I am using a large round tip, but you can use a plain coupler or no tip/couple at all. 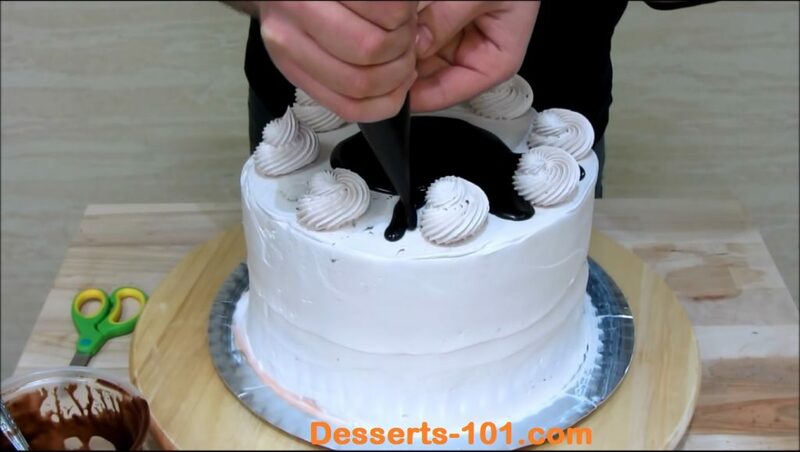 You can even spread it on with an icing spatula but you will get crumbs mixed in easier. 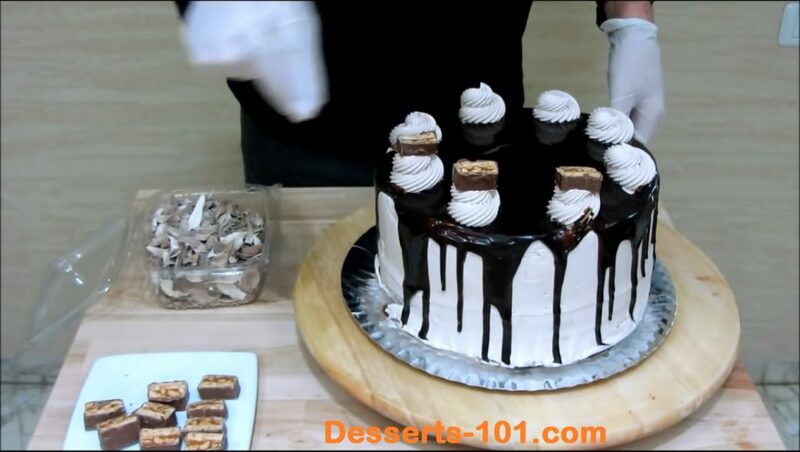 Continue adding cake, simple syrup, icing and snicker's bar pieces until stacked finishing with a later of cake. Ice the cake smooth. 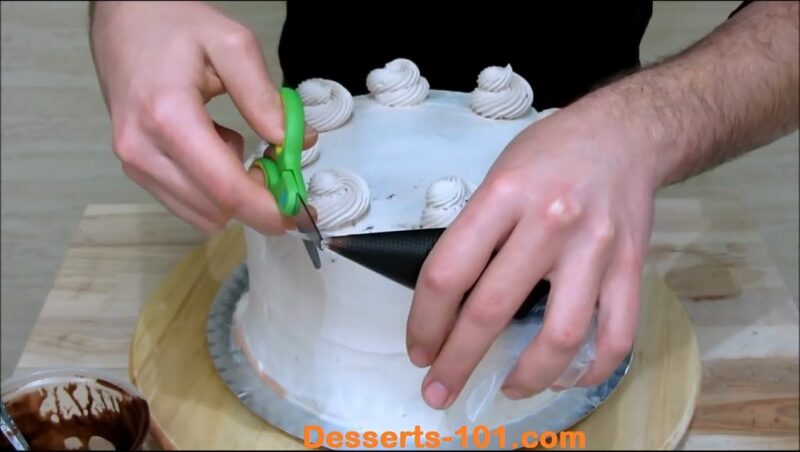 I like using a cake icer tip to eliminate crumbs in my icing. Pipe 8 rosettes on top using an Ateco #866 French Star tip. 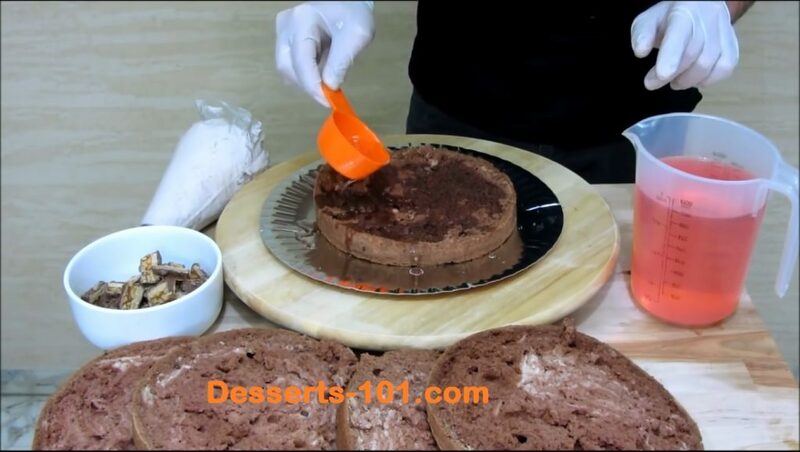 Warm the ganache until it is pourable, then fill a disposable pastry bag, cut the tip off and pipe from the center outwards. 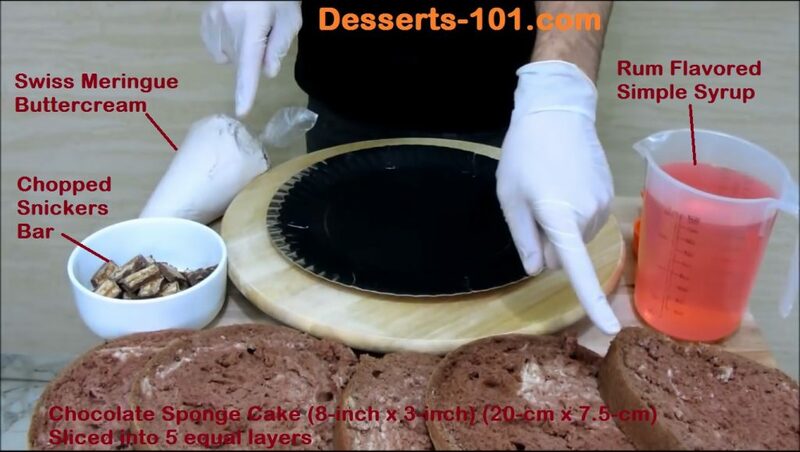 You want to go around the rosette and allow some ganache drip down the sides of the cake. 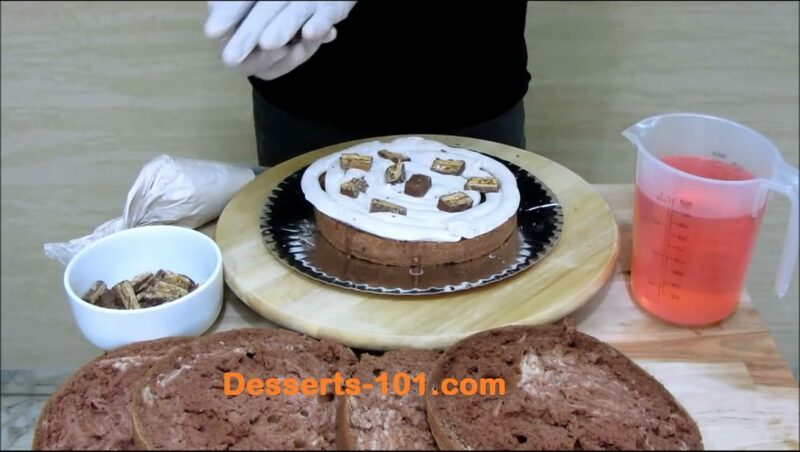 Top each rosette with a piece of Snicker's Bar. 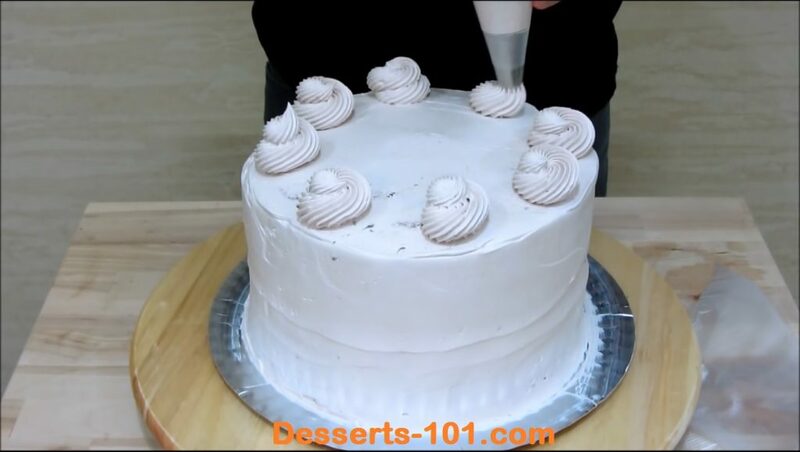 Optionally add chocolate curls between the rosettes for added decoration.